We’re right in the midst of football season, and what would be better for the little guys than a football? We figured this furry fake fur football would be perfect for the little boys to toss around, but who knows — their Daddy might have a little fun with it as well. 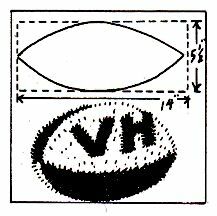 Cut out four pieces of short-pile fake fur in the colors of your local high school football team, using the shape as shown. The rectangle is 14″ long and 5 1/2″ wide, and the football pieces are drawn on the inside. On one of the light color pieces you can applique the school initials with 2 or 3 inch letters cut out of another color fake fur. This is optional, so suit yourself whether you want to do the initials or not. With right sides together, sew the four pieces together alternating the colors and leaving an opening for the stuffing. Turn right side out. Stuff with polyester or chipped foam rubber filling, until the football is firm. Sew the opening closed and you’re all ready for the football games! How many times have you needed a quick little gift for the hostess of a party or to use as a little thank you for somebody special? We have the perfect quick and easy apron that could be whipped up in no time, and would be a very thoughtful gift. Materials needed: one hand towel or printed kitchen towel, 2 1/2 yds bias tape to match one of the colors and thread to match. Hand towels and kitchen towels are usually 16″ to 18″ by 27″ to 32″, so pick one that will suite the person that will be getting the gift, and begin the little project. 1. 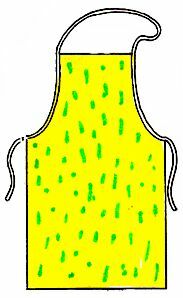 Fold the towel in half lengthwise and cut away the portions shown in the diagram — leaving 9 1/2″ at the center top. Measure down 9 1/2″ along each side, and cut out the curving line as shown. 3. Baste or pin the bias tape along the bib to the waistline at the edge of the towel. The remaining length on each side will be for the ties. Beginning at the end of one tie, sew along the edge of the bias tape, continuing from the end of the tie, along the edges of the bib, up and around the neck strap and around to the end of the other tie. Be sure to fold in a little at the end of the tie to finish the tie end. 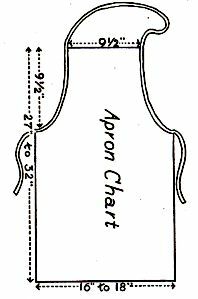 NOTE: Try one for yourself just to check out the tie lengths — depending on the size of the person you are making the apron for, you may need to use 3 to 3 1/2 yards of bias tape to insure that the ties are long enough. This months’ project is a quick and easy washcloth doll that could easily be a best seller at your next craft fair or a favorite toy for the small children that you know. Each washcloth doll takes one terry washcloth — use white, or peach color or brown, as you would like, small scraps of fabric for the pants and hat, and a small length of eyelet lace for the top (blouse). Fold the washcloth in half and mark the center with a pin. Roll the two opposite edges toward the center (fig 1). Cut the top center line 2 1/2″ down from the top for the arms, and 3 inches up from the bottom for the legs (fig 2). Tack down the raw edges. Fold the top backwards on the fold line as indicated on the diagram (fig 2). Lay a string through the top of the head; wind a string around the neck and tie firmly. Then tighten the string at the top of the head and tie. 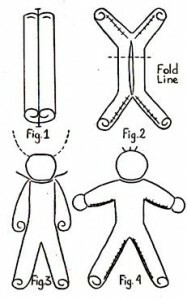 Tack the arms to the sides of the body with a few stitches (fig 3). 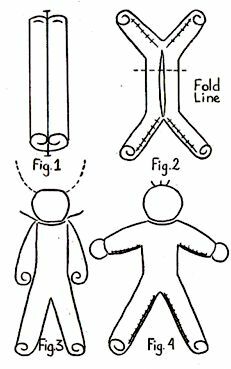 Weave the ends of the hands together and wrap the thread up from the ends of the arms about 5/8″ to form the wrists (fig 4). 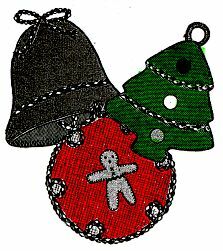 Embroider the face, following the diagram above, making the eyes blue, brows and nose brown and mouth red. Hair: For a girl doll make yarn loops around the face in desired color; for a boy, cover the back of the head with long yarn stitches, taking a few shorter stitches in the front. 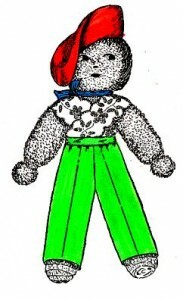 Clothing: Cut two 5″ strips of eyelet or peasant type embroidered trimming for the blouse – cross in front and back and tack to the doll. 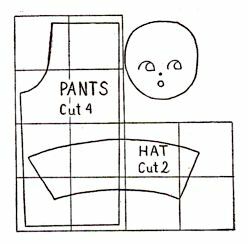 For boy doll, follow the chart to make a pants pattern, letting each square equal one inch. Cut four, stitch right sides together to form trousers; turn right side out. Fold under the raw bottom edges and crease. Pull pants onto the doll and tack around the top. Cover the stitches with bright ribbon sash. 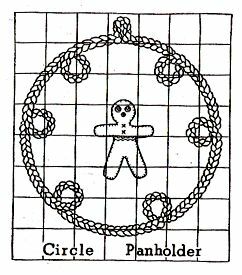 For a girl doll, cut a circle 5 inches in diameter; cut a small circle out of the center and slip over the doll, tacking the skirt to the waist. Cover the stitches with a bright ribbon sash. 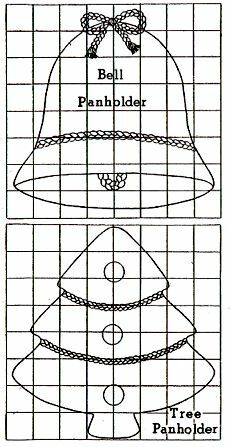 For the bonnet, cut two hat pieces (for the pattern enlarge the chart above, letting each square equal one inch), Join the bonnet at the ends with whipstitches and tack the hat to the head at a jaunty angle. Tie a ribbon at the neck to resemble a scarf. Read the particular pattern to see how big each square should be — the ones used for this pattern should equal one inch. On a sheet of paper, rule off the same number of squares in the same arrangement as shown on the chart, according to the scale given. These crossing lines guide you to drawing in the scale. Put all lines in the same positions on the large squares as they are in relation to the small squares on the chart. An easier way to enlarge a chart to one inch squares is to copy the chart that needs to be enlarged and use a photocopier to enlarge the pattern until the squares equal one inch squares. 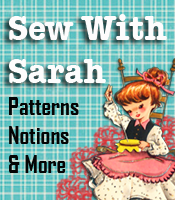 The pattern will be ready to cut and you don’t have to draw in the lines. I’ll just bet if you make several of these dolls to sit in various spots in your customer waiting area (with price tags on them) – you’ll be busy with all the orders you’ll be getting!